Digging a pit on an east facing aspect near treeline in Old Ski bowl found 17 inches (45 cm) of 4F to 1F hard wet snow over a pencil hard crust. A saturated slush layer was directly under the hard crust. 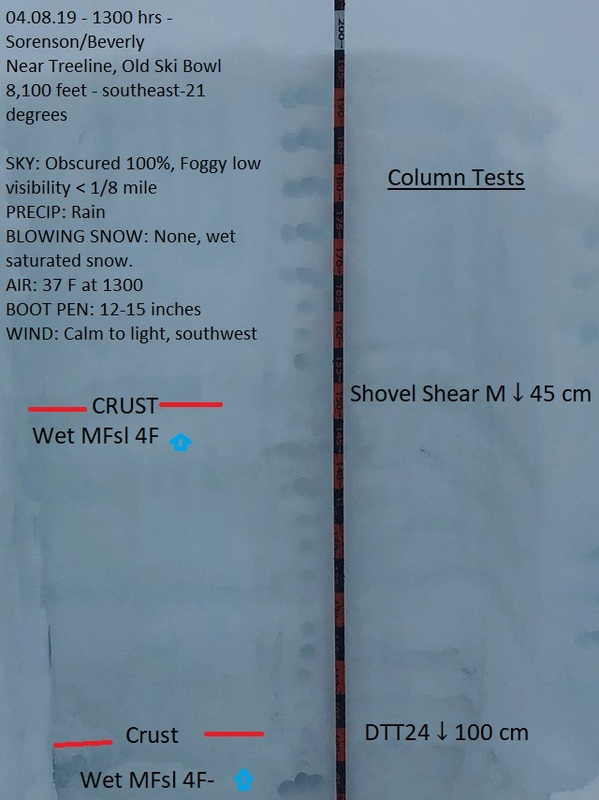 No results were found in a compression test however, this layer showed some potential with a moderate shovel shear test result. Another layer with a similar crust with slushy saturated snow properties was observed at 39 inches deep. This lower layer showed planar results in a deep tap test (DTT 24 ↓ 100 cm). No instabilities or avalanches were observed or reported however, very low visibility has limited all observations. BLOWING SNOW: None, wet saturated snow.